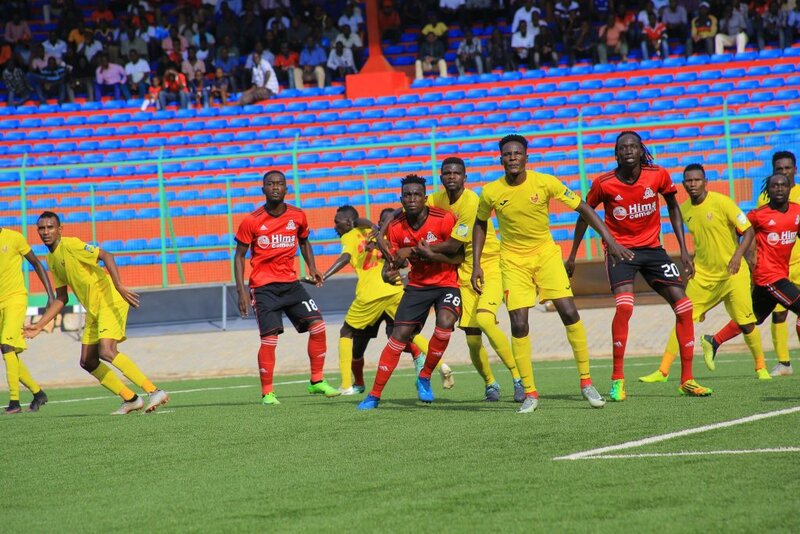 KITENDE – Vipers SC defeated Al Merreikh 1-0 at the St. Mary’s Stadium in Kitende to progress to the CAF Champions League first round. Trailing 2-1 from the first leg, the Venoms knew that a 1-0 win on Wednesday would see them through and they got it via Abraham Ndugwa’s strike a minute into the second half. The game started slowly and Al Merreikh were also happy to play on the set pace. The first corner of the game came on 5 minutes and it was awarded to the visitors. However, it did not materialize to anything as Vipers cleared their lines. Four minutes later, Al Merreikh Captain Salaheldin Nemer was elbowed in the face by Tito Okello and had to be stretchered off for treatment. Despite efforts by the medical team including wrapping of his head into a headband, Nemer was eventually substituted on 15 minutes and replaced by Mohahamed Idris. Moments after the substitution, Ahmed Mahmoud made a meaningful run down the left but could only look on in disgust as his layed on-ball missed everyone and went out for a throw in. Al Merreikh looked to be in control of proceeding and saw Mohamed Yousif effort hit the cross bar moments after referee Abdoul Twagiramukiza had blown for offside. At the other end, Tito nearly put Vipers in the lead. The former KCCA FC forward lashed onto Moses Waiswa’s well weighted through ball, turned Ahmed Ahmed and shot on the turn but his effort rebounded off Amir Suliman and went out for a corner. The resultant kick saw Dan Sseunkuma fail to turn the ball goal wards after he was played in by Halid Lwaliwa’s miss directed header. The first yellow card of the game was shown to Vipers’ Brian Nkubi for a challenge on Mahmoud. Three minutes later, Geofrey Wasswa was also shown yellow for a reckless challenge on Khaled Taha on the center line. The last chance of the first half fell to Tito but was judged to have controlled Lwaliwa’s long ball using his hand. A minute into the second half, Vipers got their goal. Wasswa collected a routine ball from Bashir Sekagya, sent a long ball for Ndugwa who controlled and finished calmly past Monged Salman in Al Merreikh’s goal. In response, the Sudanese made an instant substitution, sending on Saifeldin Maki in place of Mohamed Idris. A minute later, Halid rushed into a clearance which bounced off Yousif putting the forward one on one with Ssekagya but the custodian saved low and the ball went out for a corner. At the hour mark Vipers made a double substitution. Goal scorer-Ndugwa and Waiswa were replaced with Noah Wafula and Davis Kasirye respectively. Vipers Captain Tadeo Lwanga who came into the game carrying a yellow card from the first leg, was book on 61 minutes which means he will miss the first leg of the first round. The visitors best chance to find an equalizer came with 27 minutes to play when Yousif pounced onto lazy defending by Yayo Lutimba but his first time shot was directed wide by Ssekagya’s trailing leg. With frasturation mounting, Maki tried his luck from distance but the effort sailed wide of the mark. Kasirye missed a golden opportunity to calm the nerves in the St. Mary’s Stadium as he blazed over from 5 yards after he was played in expertly by Wafula. From there on, it was more of preserving the lead for Vipers who managed to see out the remaining minutes minus conceding any clear cut chances. The 1-0 result means Vipers move into the first round of the competition via the away goals run following a 2-2 aggregate draw. They will next take on either Constantine or GAMTEL who play their return leg later on Wednesday. The first leg ended 0-0. Bashir Ssekagya (GK), Livingstone Mulondo, Moses Waiswa, Dan Sserunkuma, Abraham Ndugwa, Tadeo Lwanga (c), Brian Nkuubi, Tito Okello, Halid Lwaliwa, Yayo Lutimba, Wasswa Geofrey. Monged Salman (GK), Mohamed Mahamoud, Taha Khaled, Muhamad Yousif, Ahmed Mahmoud, Dhiya Musa, Salaheldin Suliman, Ahmed Ahmed, Mohamed Idris, Ramadan Shareif (c).